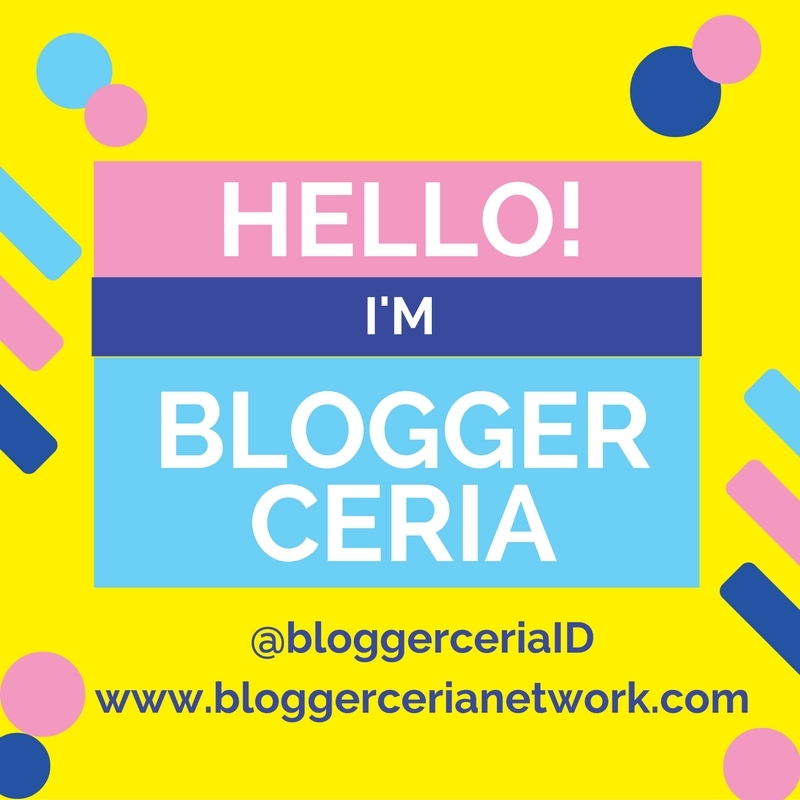 Back to blogging after 2 weeks post Aidl Fitri yah, anyway, congratulations for those who celebrate yah. I just got back from family mudik ritual myself. 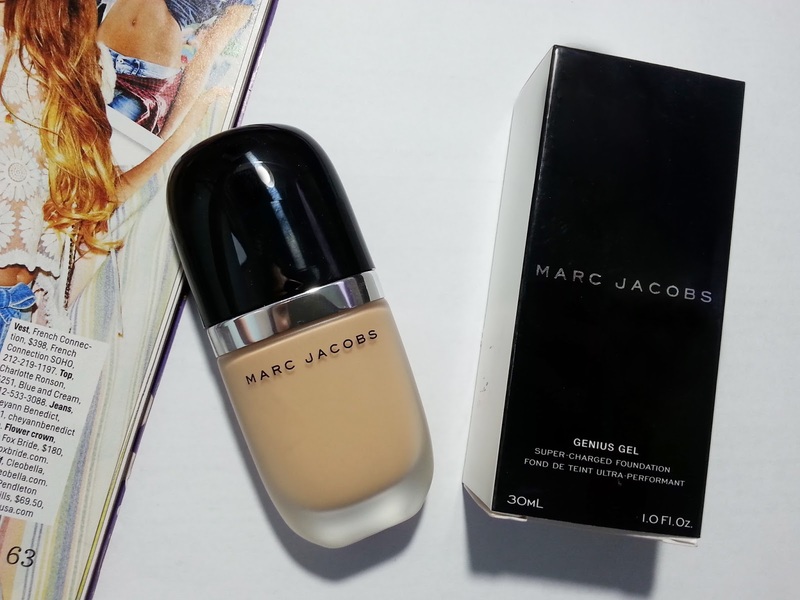 Anyway, today's post is about my new foundation i got from last month's beauty workshop with Sephora X Marc Jacobs. This Marc Jacobs genius gel foundation wasn't the first high end foundation i have ever tried. But, this goes to my top favorites high end foundations right away..
First, lets's talk about the packaging. The box itself has this cool vibe, and it screams Marc Jacobs' modern luxury image. 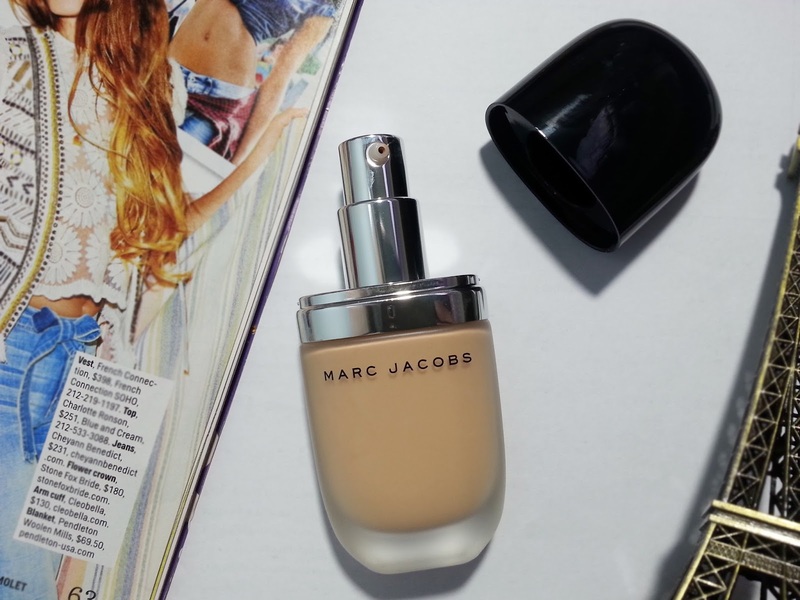 With this Genius Gel super charged foundation, it is impossible to ignore the bottle! Oh, how i love the design. 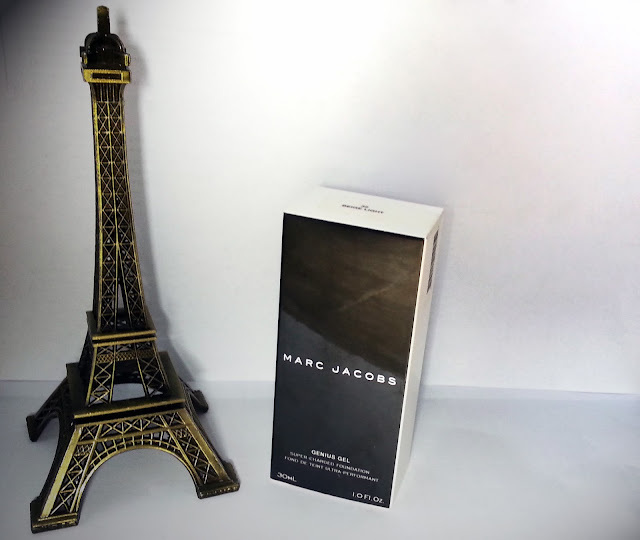 Its not your typical boring foundation bottle, as a matter of fact i believe it's the first foundation that comes with this rounded-edge packaging. It is sleek, clean, chic, handy, and surprisingly lightweight. The packaging was a dove-glass bottle. It contains 30 ML of products and thank God it comes with a pump. Makes our life easier right? This foundation contains anti-aging agent, a long wearing, natural finish. i am wearing number 32 Golden Light. 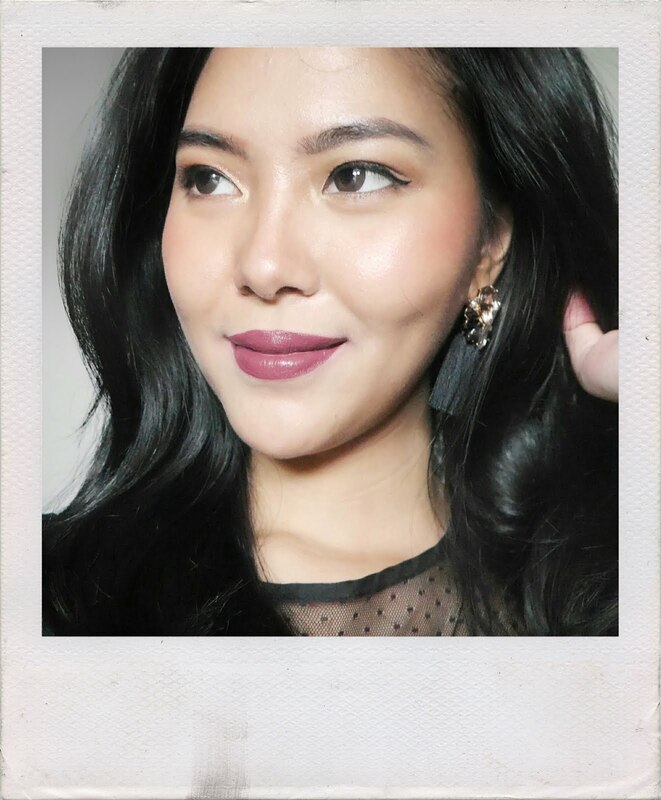 Seperti biasanya, aku selalu kesulitan memilih foundie yang cocok karena kulitku somewhere between light skin, but has a yellow undertone. Thank god this foundie has a quite wide variety of shade, so i choose this one. Texture wise, i kinda hard to explain it. It's a light-weight liquidy gel-like. Quite unique. From the after blending picture we could take a quick judge, that it is very seamless, very natural, glowy, and very light weight. You barely see nothing here. The second picture on the right is me wearing MJ genius gel foundie on a second layer. The results is kinda amazing because you don't have to put any powder over your face. It is luminous, matte powdery finish which is kinda awesome. But if you prefer to add powder to set everything, that's fine. Omg, this is perfect for daily wear or for that special occassion. Because this foundation DOESN'T CREASE AT ALL! Doesn't clogged pores, doesn't oxidize, doesn't faded, very flawless, became full coverage after 2 layers and actually it's very build-able. I don't see any problem putting another layer on my face. This doesn't get cakey at all as well. In photos, this looked REALLY GOOD. Well, for you my loyal readers.. you all know that my intentions from makeup are always to reach natural effortless beauty and this foundation are actually help me to achieve that. The finish is somewhere between matte, glowy, natural and it looked like..just a perfect skin. one layer with concealer under eye & setting powder, with natural lighting. 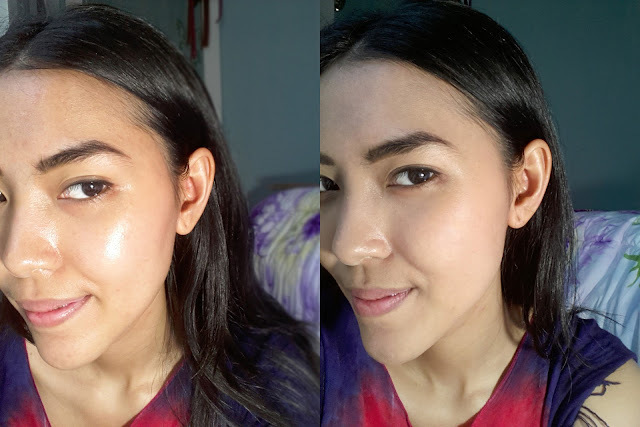 I am actually really liking it because in photos, i am not afraid or didn't have to worry about getting an uneven color on my face, or a white cast or beluk kaya mbak-mbak yang dandannya ketebelan, or worrying to have my foundation oxidize during the middle of a hot day. expensive? well, compare to other high end foundations (channel, dior, etc) yang biasanya harganya jauh lebih mahal, this actually a reasonable price. 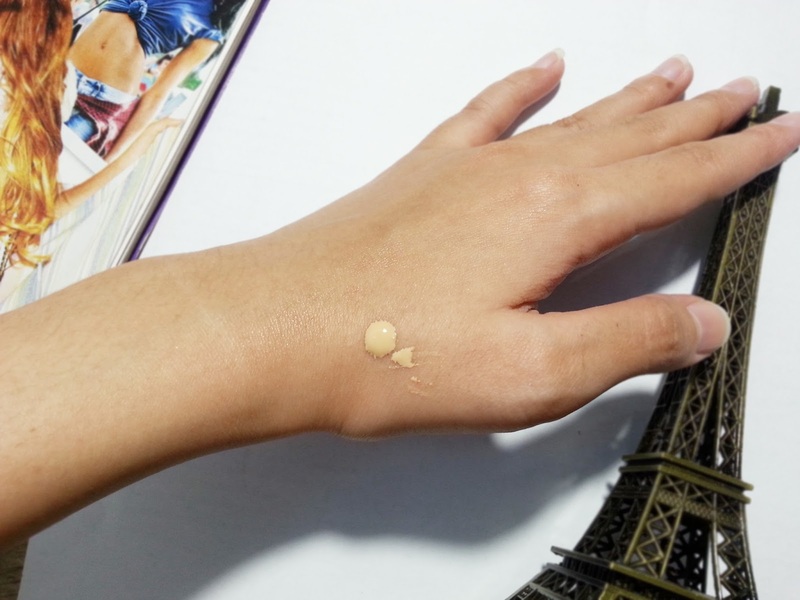 Last Bite: This fancy foundation perfect for that special occasion, just doubled the layer and you're good to go. It actually pricey so i don't have the intention to wear it daily. On daily basis, i still prefer cc creams instead of foundation. 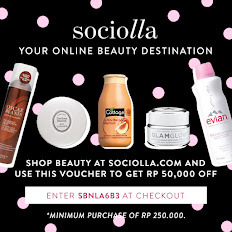 Untuk harganya IDR 700.000+++ you actually buying a quality. Recommended for people who actually have the budget and looking for a flawless, lighweight, natural looking foundation. Tapi kalo ngga butuh-butuh banget, cari alternatif aja beli yang lebih murah. I have seen many good reviews about this foundation. I am really wondering to get one, but there is no store in U.K from where I can check my shade and purchase one. Moreover, I am very new in makeup line, recently just done with my makeup lesson by Lina, who trains best make-up lesson London . Can you please suggest me a perfect match for NC42?